I forgot. There will be no new “real” post this 5th Sunday of the month, a non-event for which I take entire credit. But in the interests of holding our place, I googled “Art” and here’s the first “art” image that appeared. 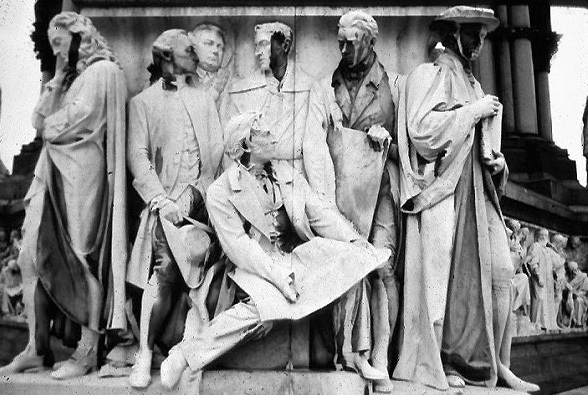 Painters of France, a sculpture on the Albert Memorial by Henry Hugh Armstead. The Tupper article begins with a bit of art criticism, which is worth reading, if only to educate you on how benign we are here on Ragged Cloth. To be fair, it was contemporary with the Albert Memorial which was designed and executed in the 10 years following Albert’s death in 1861. I do wonder who is responsible for the fine masks that some of the painters wear — pigeons or contemporary commentators? I find the blackened bits entirely fetching. And I also find that I can’t sort out who is who in the description given — maybe I’ve copied info on the wrong set of sculptures. But this will do for the nonce — those of you expert on the Albert Memorial can perhaps fill us in…..
Actually Kathy, I suspect you’ve never seen it because a) it was maybe one of the last sculptures that incorporated all time and all history as well as all the British colonies, in a (sort of) realistic manner; and b) you aren’t an anglophile, versed in Victorian novels, and so wouldn’t have spent your precious visiting time in London wandering around this memorial. I made my then 14 year old daughter try to work out the symbolism for me; she just kept asking for ice cream. I’ve never seen this before (and having been subjected to an art history education in a university means I’m missing brain cells, or they didn’t want us to study poop-stained statues). Those guys were really ahead of their time. Maybe they are all mad at the guy with the cell phone for taking the call during the meeting. I thought the figure to the left was talking on his cell phone. They do look a bit unhappy, don’t they? I’m sure it’s a committee meeting about the new logo. The one on the cell phone is calling yet another vendor for a new logo design; the one on the right definitely has his own logo that he’s about to whip around and confront the group with. The two behind the seated figure who are talking to one another are making arrangements to meet up for drinks later where they will make the decision about the logo that the rest of the idiots are blathering on about. The guy who is seated, however, is the CEO, who has already decided. He isn’t bothering to look at any of the rest, just waiting for them to realize that no discussion is necessary. The discoloration of the stone reminded me of this Mannerist sculpture, “Abduction of the Sabine Women” by Giovanni Da Bologna. Maybe the colors of the marble don’t show up till the sculptor is too invested in the piece? Or is it a valued surprise, like dyeing cloth or raku pottery? I couldn’t match the description to the figures either. So it invites us to make up our own story. The one on the right could well be Italian. His clothes are different, certainly, and he has to wear a hat to keep off the bright southern sun. Is Raffaelle a variation of Raphael? The seated figure must be the one with the plan and the rest of them are having an argument about it. He’s the one with the most acclaim so he gets to sit. One just to the right is about to bring out his own plan to counter the main figure’s. The one on the left is feeling shunned because he doesn’t make art in the approved style. What a radical – no styled wig or ponytail. If they are painters, where are their brushes? Did they have a paint fight and that’s why they are discolored?